“As the second highest value cryptocurrency after Bitcoin [by market cap], the ETH wallet’s place on the Wirex app is indisputably deserved,” Wirex’s Dmitry Lazarichev. Ethereum extended the gains above the resistance at $286 after recovering from the support at $284. 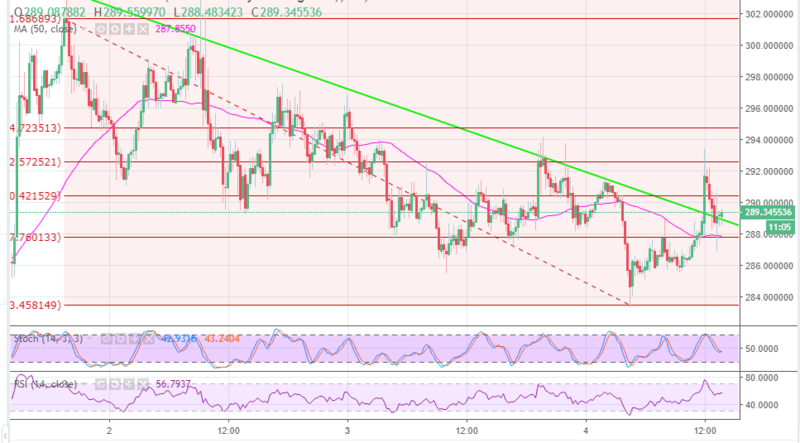 Ethereum extended the gains above the resistance at $286 after recovering from the support we discussed in the previous analysis at $284. The bulls also cleared the snag at the 23.6% Fib level with a drop from $301.68 to $283.45, which coincided with the 15-minutes 50SMA. A brief spike followed with ETH/USD stepping above $290 and forming an intraday high of $292.47. There was also a break above the bearish trendline (currently working as support), but the bulls could not sustain the trend above $290 hence a slide to $288 ensued. The 50 SMA currently at $287 will offer support but $286 and $284 will come in handy.